Qigong is a Chinese health exercise made up of gentle movements that connect with the acupuncture points and meridians of our body. The word Qigong literally means “energy work”. 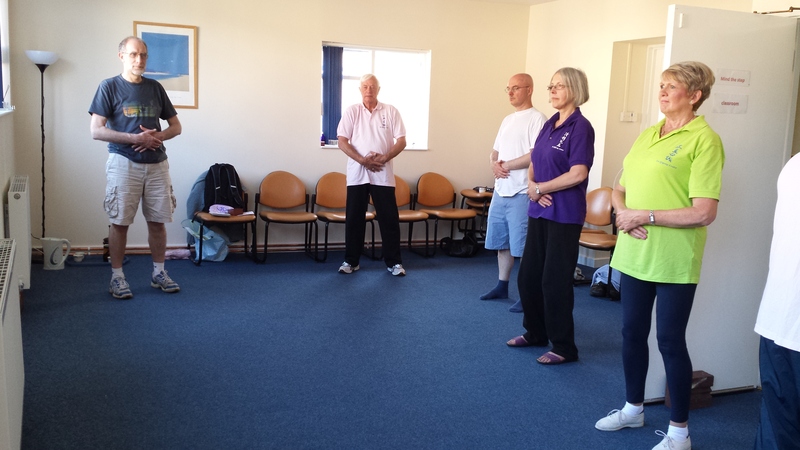 Using relaxation and breathing along with these special movements, we have Qigong. 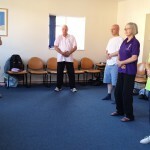 Qigong will help you to relax and become more aware of your body. As we practise, we will begin to notice changes in our body including more flexibility, energy and stamina. This is because the Qi is working to heal any old illnesses or injuries and to open the channels so that the Qi can flow naturally, making us feel younger and more alive. There are many types and styles of Qigong, but the style which you will learn is called the Kunlun Dayan – Wild Goose Qigong system. 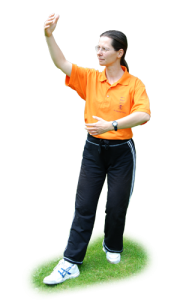 There are several forms in the Kunlun Dayan Qigong system and each form has its own special emphasis. For instance, Dayan (Wild Goose) Qigong is good for overall health and flexibility of the body. Balancing Gong is good for beginners, helping them to learn the right posture and relaxation. Jade Pillar Gong is good for the spine and Dayan Palm is a very vigorous form which combines soft, gentle movements with jumping and kicking to make the body stronger and lighter. 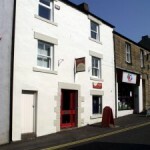 Also included in the system are several meditation and healing methods which are used for cultivating the body and mind. In the past, there were 72 forms and methods in the system and, today, just over half of these have survived. Nearly two thousand years ago during the Jin Dynasty (265-420AD), Kunlun Shan, which is a mountain range near Tibet, was home to many Daoists. The monks living there would spend their days studying Daoist teachings, hoping to eventually receive enlightenment and immortality. Kunlun Shan was also home to many wild geese called Da Yan (Big Wild Goose). They were not normal geese as these geese, believed to be the Bar Headed Goose, live twice as long and fly higher than any other geese in the world. The Da Yan became a symbol of longevity to the monks who observed these special birds closely. They began to imitate their movements and combine this with their knowledge of Chinese medicine, eventually creating the sets of health exercises known as Dayan Qigong. The Jin Dynasty saw the rapid expansion of both Buddhism and Daoism. One Buddhist monk named Dao An was the translator of many Buddhist texts and connected with the Pure Land (Amitabha) Buddhism particularly. This type of Buddhism concentrated only on chanting the name of Amitabha Buddha so that they might be reborn in his Western Pure Land. The idea of letting go of the mind and body so that enlightenment will happen naturally follows the principles of the Kunlun Dayan Qigong skill. Hence, Dao An was considered the spiritual founder of the skill. It is because of this special lady, Grandmaster Yang Meijun, that all of us have the opportunity to learn the Kunlun Dayan Qigong. When she was 13 years old, her grandfather began to teach her secretly, making her promise not to teach anyone until she was 70 years old as this was the promise he had made to the Daoist monk who had taught him. Although she was only supposed to pass on the skill to one other person, she had survived the Japan War and Cultural Revolution where many others did not. She did not want to see the skill lost so she decided to slowly open the skill to the public after the end of the Cultural Revolution. Master Michael Tse is one of the few people who was accepted as a close student by Grandmaster Yang Meijun and given permission by her to teach her skill. 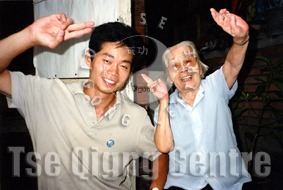 It is due to Master Tse’s efforts over the past three decades that Wild Goose Qigong and Qigong as a whole are now widely known in the west. 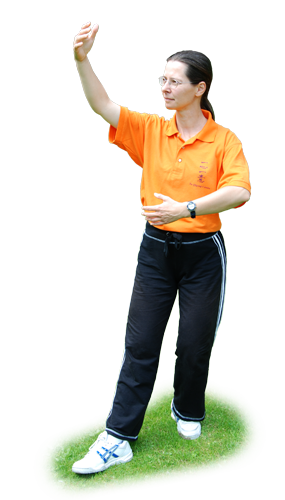 Christine Barbier has always had an interest in looking after and developing her own health and it was that interest that initially led her to study the traditional skill of Dayan Qigong with her Sifu Martin Gale (and Martin Hird before that) and her Sigong (grand teacher) Master Tse. Being able to teach and pass on the skill was the next step to help others look after and develop their own health. 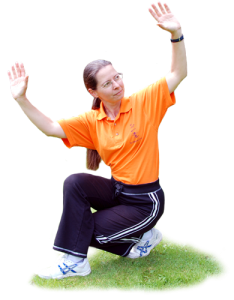 When starting the practice of Qigong, the movements are gentle and easy to remember, and these are always taught at a pace suitable for the learner. 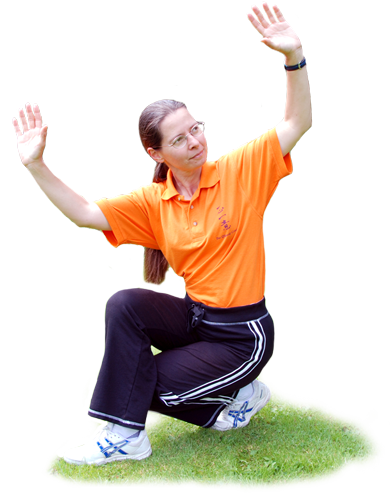 Before practicing Qigong, warm up exercises prepare the body by moving and loosening the trunk, legs and upper body. The first two forms, called “Balancing Gong” and “Healthy Living Gong” comprise sets of single movements, slowly increasing in difficulty, and each repeated several times. The next form, called the “Wild Goose”, comprises a series of connected and flowing movements. When performing the movements, the body is moved in many different ways, helping to develop the muscles, joints and bones, massaging the internal organs and promoting circulation in the body. At the end of the Qigong practice, the movements (yang energy) are balanced with meditation (yin energy) during which time the body and the mind settle and the energy is stored.